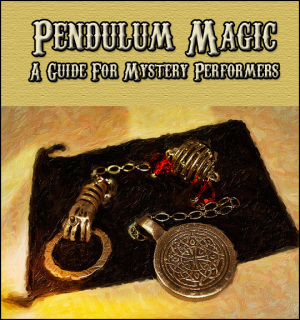 Reviews for "Pendulum Magic: A Guide for Mystery Performers"
Bill Cushman, author and reviewer writes: "I was fortunate to receive a copy of Pendulum Magic: A Guide To Mystery Performers for review from David Thiel. I will also be contributing to the second book due for release in the fall. "The first thing that struck me about Pendulum Magic is David’s writing style. His passion for the topic is obvious from word one. He evoked memories of the first time a pendulum ever swung in my own hands via both his eloquence and sense of humor. "Pendulum Magic is replete with wonderful contributions. Rich Hennessey, of MentalCraft and a master pendulum artisan in his own right, provides an introduction that sets the mood for what is to follow. "As per David’s goal, each contribution is more than just an effect. They all contain nuances applicable to maximize the impact of any pendulum performance. "While not quite a guide for newcomers, there is plenty of information to set pendulum novices on the right path. And experienced users of my favorite “instrument” for the mystery performer will find much within Pendulum Magic to excite and inspire their own work. "As they’ve already been well described, I won’t bother discussing the effects individually. They range from the heart warming to the heart pounding and everything in between. From classic mentalism presentations to storytelling and the quite bizarre, they all hold in common the potential to deeply engage your audience in a unique experience they will long remember. "I am also very excited about the site David has set in place, where Pendulum Magic has its home. I’ve long wanted a forum devoted to pendulums and it is finally here. One stop shopping for all your pendulum needs, including the most important need; to be able to share and brainstorm with your pendulum peers! "The pendulums I’ve seen so far are exquisite. I had no plans to buy one quite yet but when I saw the Gypsy on sale, I couldn’t resist. Just looking at the photo inspired me to begin shaping a routine. "David, I wish you great success with this fantastic project and look forward to helping make the forum dynamic and valuable. To everyone who contributed to Pendulum Magic, you have my utmost appreciation and respect for your wonderful routines. Without reservation, I highly recommend Pendulum Magic: A Guide To Mystery Performers to anyone with an interest in pendulums." Mauricio Jaramillo (one of our contributors) says: "You'll find all sorts of routines there, from impromptu material to bizarre magick experiences. David's writing style is very entertaining too, his story on why pendulums rock was enjoyable to read and reminded me of how strong the experience our clients and spectators feel can be." Paul Prater (a contributor) says: " All I can say is that I am honored to be a part of this book. David is a complete professional and a nice guy. Everything looks first class." TC Tahoe (who also wrote one of the routines) says: "I am really enjoying this book. I commend you on the book and the website, thank you for this David."